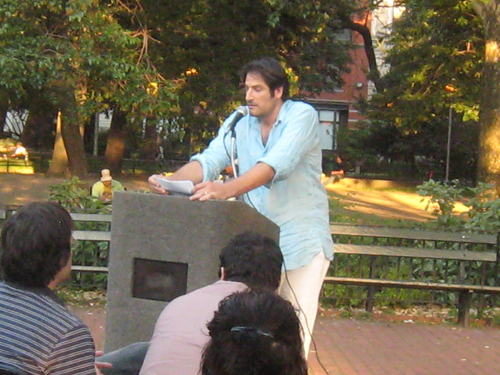 Sponsored by the New York City Department of Parks & Recreation, Open City, and Mr. Beller’s Neighborhood, Park-Lit is a summer weekly series that stages readings sponsored by local literary magazines in city parks. Mr. Beller's Neighborhood, A Public Space, Opium, New York Tyrant, Guernica, BOMB, and Groundwork. See below for the schedule. A Brooklyn reading with Willie Perdomo and Patricia Smith in Von King Park, featuring music and events for children. Von King Park is in Bedford Stuyvesant, three blocks south of Dekalb ave. The amphitheatre where the reading will be held is nearest to the northeast side of the park near Lafayette Ave and Tompkins Ave.
then walk 2 blocks south to Greene Ave.
- OR take the G to Myrtle/Willoughby Ave. Walk 8 blocks south to Greene Ave.
Groundwork, a Brooklyn-based nonprofit, supports the development of powerful youth, powerful families, and powerful communities. The creators of the acclaimed and outrageous competitive reading series “Literary Death Match” make mayhem in the great outdoors this July in the Lower East Side. Born and bred in New York City, these writers are as complex, provocative and original as the city that’s shaped them. Expect the unexpected and come ready to rumble -- this showdown will not be a spectator sport! Michele Carlo is a writer/performer who has lived in four of the five boroughs of NYC and remembers when a slice of pizza cost fifty cents. Her stories have been published in Mr. Beller’s Neighborhood’s Lost & Found: Stories From New York, Chicken Soup For The Latino Soul and SMITH Magazine. A frequent contributor to NYC’s storytelling community, Carlo has been a two-time GrandSlammer at The Moth. Her memoir about growing up as a redheaded Nuyorican in 1960s-00s NYC, Fish Out Of Agua: My life on neither side of the (subway) tracks; will be published by Citadel Press in August. Ed Lin is the author of three novels -- Waylaid, This Is a Bust (both published by Kaya Press) and Snakes Can't Run (Minotaur Books). Lin, who is of Taiwanese and Chinese descent, is the first author to win two Members' Choice Awards in the Asian American Literary Awards. He holds degrees in mining engineering and journalism from Columbia. He lives in New York with his wife, actress Cindy Cheung. Jim O’Grady has worked as a reporter for The New York Times, professor of journalism at NYU and research director at The Center for an Urban Future, a policy think tank. He is the author of two biographies, “Dorothy Day: With Love for the Poor” and “Disarmed & Dangerous: The Radical Lives and Times of Daniel and Philip Berrigan.” He has won seven Moth storyslams and The Moth GrandSLAM. Born and raised in the Bronx, he lived on Staten Island from 1990 to 2000, and lived to tell about it. Susan Froderberg's novel OLD BORDER ROAD will be published by Little Brown in December, 2010. Her stories have appeared in Conjunctions, Antioch Review, Prairie Schooner, Alaska Quarterly, Massachusetts Review, as well as the New York Tyrant. Eugene Marten is the author of Waste and In the Blind. He lives in New York City. A Public Space, together with the Center for Documentary Studies at Duke University and Swingbound, host Author Sam Stephenson and a jazz quartet in beautiful Fort Greene Park. Directions: Subway: M, Q, R, or B Trains to Dekalb Avenue, #4 or #5 to Nevins Street, C Train to Lafayette Ave or G Train to Fulton St.
Joshua Kors is an investigative reporter for The Nation, where he covers military and veterans' issues Kors earned national attention for his work uncovering the veterans' benefits scandal. His three-part series showed how military doctors are purposely misdiagnosing soldiers wounded in Iraq, labeling them mentally ill in order to deny them medical care and disability pay. He is the winner of the National Magazine Award, George Polk Award, IRE Award, National Headliner Award, Casey Medal, Mental Health Media Award, and the military Reporters and Editors Award. He was also a finalist for the Michael Kelly Award, Livingston Award, Tom Renner Award, John Bartlow Martin Award, Harvard's Goldsmith Prize for Investigative Reporting, and the American Bar Association's Silver Gavel Award. His work is featured in the American Society of Magazine Editors' recent anthology The Best American Magazine Writing 2008. Terese Svoboda’s poems are as haunting as they are funny, as pleasurable as they are powerful,” wrote Publisher’s Weekly about Terese Svoboda’s Weapons Grade, published last year by U. of Arkansas Press. Her fifth book of poetry, it contains poems that appeared in the Times Literary Supplement, Paris Review, The New Yorker, and Tin House. Svoboda is also the author of four novels and Black Glasses Like Clark Kent, a memoir that won the 2007 Graywolf Nonfiction Prize and was named “Best of Asia 2008” by the Japan Times. She taught fiction at Columbia’s School of the Arts this spring and this fall will see the publication of her fifth novel, Pirate Talk or Mermalade. Alexander Chee was born in Rhode Island, and raised in South Korea, Guam and Maine. He is a recipient of the 2003 Whiting Writers’ Award, a 2004 NEA Fellowship in Fiction, a 2010 Massachusetts Cultural Council Fellowship and residencies from the MacDowell Colony, Ledig House, the Hermitage and the VCCA. His second novel, The Queen of the Night, is forthcoming from Houghton Mifflin Harcourt in fall of 2011. His first novel, Edinburgh (Picador, 2002), is a winner of the Michener Copernicus Prize, the AAWW Lit Award and the Lambda Editor’s Choice Prize, and was a Publisher’s Weekly Best Book of the Year. In 2003, Out Magazine honored him as one of their 100 Most Influential People of the Year. His essays and stories have appeared in Granta.com, Guernica, Out, The Morning News, The Man I Might Become, Loss Within Loss, Boys Like Us and Mentors, Muses and Monsters. He has taught writing at Wesleyan, The New School and Amherst College.